Kitchen lighting can be the perfect place to add a little shine and personality to your meal-prep space. 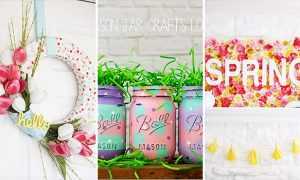 You can add a bold color, blend in an earthy texture or install a glimmering focal point. 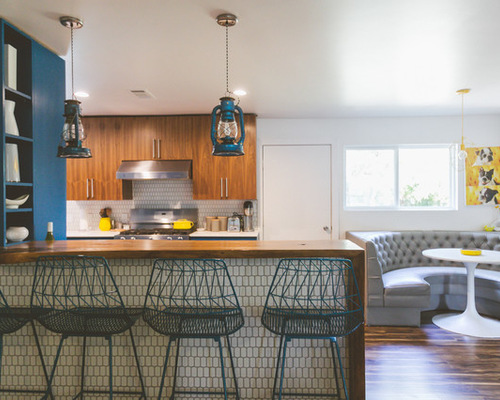 Check out these kitchens, personalized by homeowners from our My Houzz series, and see if they spark any bright ideas. 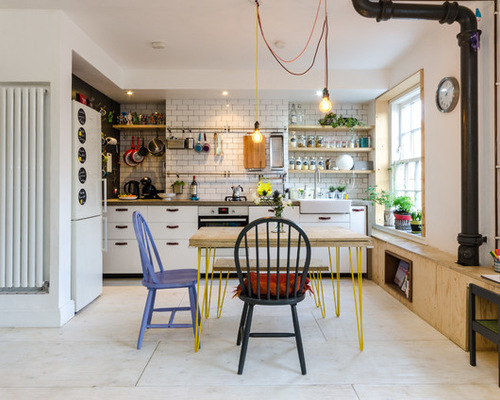 Bare bulbs dangle from colorful wires in this London home full of DIY projects and Ikea hacks. 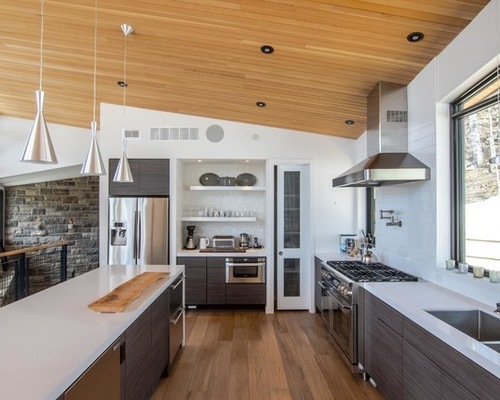 The two architects who call this kitchen home came up with the design and created most of the furnishings themselves. 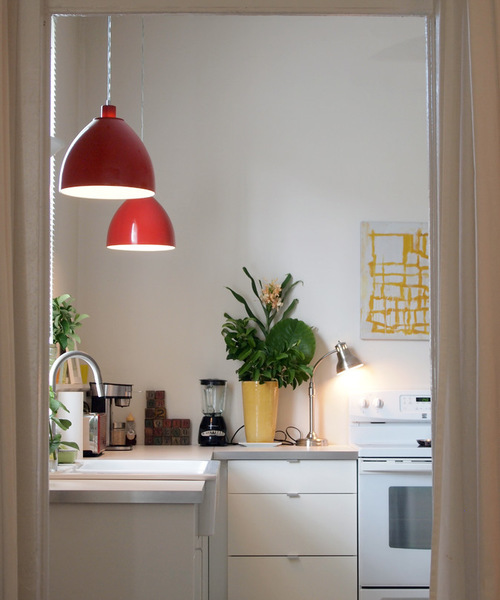 Throughout the kitchen, you’ll find nooks for storage and other colorful kitchen essentials, such as pots and mugs, hanging from a painted pegboard. 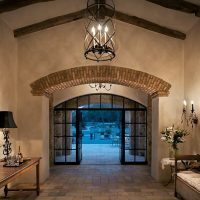 This Texas family wanted the kitchen to have an eclectic feel, and these lanterns fit the bill. 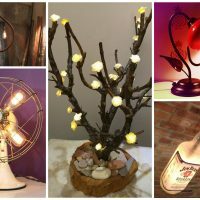 They found them at a local antiques mall and had them converted into pendant lights. They pair well with the blue cabinets and row of blue bar stools. Two pendants made from sculptural wood hang above this San Antonio kitchen island. The designer, who is also the homeowner, used the lights to help create the clean, transitional feel in her kitchen. 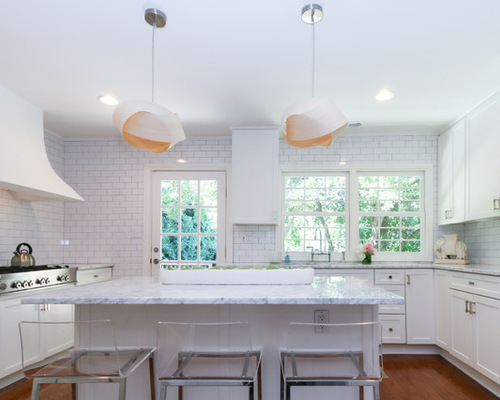 She finished off the room with white subway tiles and Carrara marble countertops. Nothing is traditional in this converted shipping-container home, including the lights. 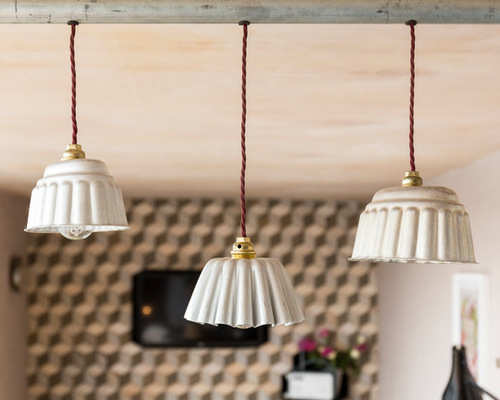 The designer, who is also a TV personality, transformed vintage gelatin molds into pendant lights. Other custom creations found in this home include fold-down shelves and a handmade coffee table. This Canadian family loves to entertain and cook — so much so that they can host up to 25 guests at their place. To meet the needs of the big crowds, they added a long island to the kitchen. Shiny, cone-shaped pendants hang above the space to illuminate party prep and food. 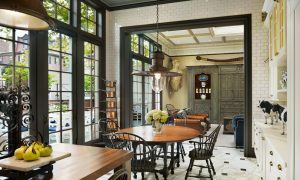 As soon as you walk through the front door of this New Orleans home, the red pendants in the kitchen catch your eye. These two red lights hang right above the countertop. 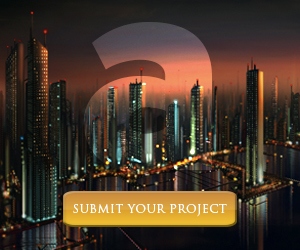 The homeowners chose them for their energizing color. This California homeowner wanted a modern vibe in her kitchen. 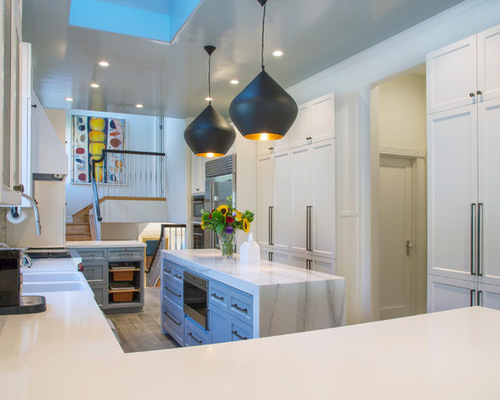 She achieved that through linear hardware, a waterfall-edge marble island, high-arch faucet and these oversize pendant lights. These details are a small part of how this kitchen went from closed off and dark to open and light filled. 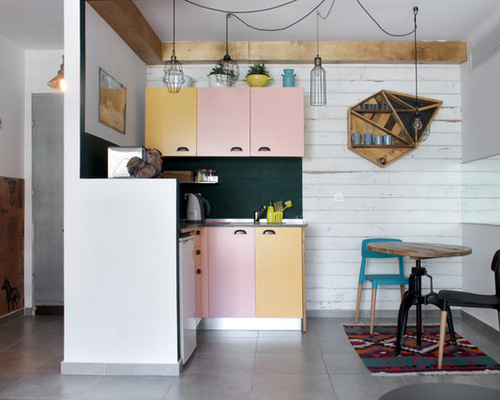 The couple who own this colorful space use it as a weekend getaway, so the kitchen doesn’t need to be huge. They scaled it down and kept it minimal, such as with the light bulbs covered in different cages. 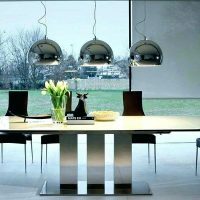 These bare-minimum lights hang from the counter to the table at different heights, creating visual interest in a compact kitchen.